by Martini, Frederic H.; Timmons, Michael J.; Tallitsch, Robert B.
Dr. Martini received his Ph.D. from Cornell University in comparative and functional anatomy for work on the pathophysiology of stress. In addition to professional publications that include journal articles and contributed chapters, technical reports, and magazine articles, he is the lead author of ten undergraduate texts on anatomy and physiology or anatomy. Dr. Martini is currently affiliated with the University of Hawaii at Manoa and has a long-standing bond with the Shoals Marine Laboratory, a joint venture between Cornell University and the University of New Hampshire. He has been active in the Human Anatomy and Physiology Society (HAPS) for over 24 years and was a member of the committee that established the course curriculum guidelines for A&P. He is now a President Emeritus of HAPS after serving as President-Elect, President, and Past-President over 2005–2007. Dr. Martini is also a member of the American Physiological Society, the American Association of Anatomists, the Society for Integrative and Comparative Biology, the Australia/New Zealand Association of Clinical Anatomists, the Hawaii Academy of Science, the American Association for the Advancement of Science, and the International Society of Vertebrate Morphologists. Dr. Tallitsch received his Ph.D. in physiology with an anatomy minor from the University of Wisconsin–Madison at the ripe old age of 24. Dr. Tallitsch has been on the biology faculty at Augustana College (Illinois) since 1975. His teaching responsibilities include Human Anatomy, Neuroanatomy, Histology, and Cadaver Dissection. He is also a member of the Asian Studies faculty at Augustana College, teaching a course in Traditional Chinese Medicine. Dr. Tallitsch has been designated as one of the “unofficial teachers of the year” by the graduating seniors at Augustana 19 out of the last 20 years. 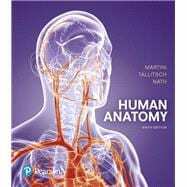 Dr. Tallitsch is a member of the American Association of Anatomists, where he serves as a Career Development Mentor; the American Association of Clinical Anatomists; and the Human Anatomy and Physiology Society. In addition to his teaching responsibilities, Dr. Tallitsch currently serves as a reviewer for the Problem-Based Learning Clearinghouse and has served as a visiting faculty member at the Beijing University of Chinese Medicine and Pharmacology (Beijing, PRC), the Foreign Languages Faculty at Central China Normal University (Wuhan, PRC), and in the Biology Department at Central China Normal University (Wuhan, PRC). Dr. Judi Nath is a biology professor and the writer-in-residence at Lourdes University, where she teaches at both the undergraduate and graduate levels. Primary courses include anatomy, physiology, pathophysiology, medical terminology, and science writing. She received her Bachelor’s and Master’s degrees from Bowling Green State University, which included study abroad at the University of Salzburg in Austria. Her doctoral work focused on autoimmunity, and she completed her Ph.D. from the University of Toledo. Dr. Nath is devoted to her students and strives to convey the intricacies of science in captivating ways that are meaningful, interactive, and exciting. She has won the Faculty Excellence Award—an accolade recognizing effective teaching, scholarship, and community service—multiple times and in 2013 was named as an Ohio Memorable Educator. She is active in many professional organizations, notably the Human Anatomy and Physiology Society (HAPS), where she has served several terms on the board of directors. Dr. Nath is a coauthor of Fundamentals of Anatomy & Physiology, Visual Anatomy & Physiology, Visual Essentials of Anatomy & Physiology, and Anatomy & Physiology (published by Pearson); and she is the sole author of Using Medical Terminology and Stedman’s Medical Terminology (published by Wolters Kluwer). Her favorite charities are those that have significantly affected her life, including the local Humane Society, the Cystic Fibrosis Foundation, and the ALS Association. In 2015, she and her husband established the Nath Science Scholarship at Lourdes University to assist students pursuing science-based careers. When not working, days are filled with family life, bicycling, and hanging with the dogs. Dr. Ober received his undergraduate degree from Washington and Lee University and his M.D. from the University of Virginia. He also studied in the Department of Art as Applied to Medicine at Johns Hopkins University. After graduation, Dr. Ober completed a residency in Family Practice and later was on the faculty at the University of Virginia in the Department of Family Medicine and in the Department of Sports Medicine. He also served as Chief of Medicine of Martha Jefferson Hospital in Charlottesville, VA. He is currently a Visiting Professor of Biology at Washington and Lee University, where he has taught several courses and led student trips to the Galápagos Islands. He was on the Core Faculty at Shoals Marine Laboratory for 24 years, where he taught Biological Illustration every summer. Dr. Ober has collaborated with Dr. Martini on all of his textbooks in every edition. Claire E. Ober, R.N., B.A., practiced family, pediatric, and obstetric nursing before turning to medical illustration as a full-time career. She returned to school at Mary Baldwin College, where she received her degree with distinction in studio art. Following a five-year apprenticeship, she has worked as Dr. Ober’s partner at Medical & Scientific Illustration since 1986. She was on the Core Faculty at Shoals Marine Laboratory and co-taught the Biological Illustration course with Dr. Ober for 24 years. The textbooks illustrated by Medical & Scientific Illustration have won numerous design and illustration awards. Dr. Welch received her B.A. from the University of Wisconsin–Madison and her M.D. from the University of Washington in Seattle, and did her residency in Family Practice at the University of North Carolina in Chapel Hill. Participating in the Seattle WWAMI rural medical education program, she studied in Fairbanks, Anchorage, and Juneau, Alaska, with time in Boise, Idaho, and Anacortes, Washington, as well. For two years, she served as Director of Maternal and Child Health at the LBJ Tropical Medical Center in American Samoa and subsequently was a member of the Department of Family Practice at the Kaiser Permanente Clinic in Lahaina, Hawaii, and on the staff at Maui Memorial Hospital. She was in private practice from 1987 until her retirement in 2012. Dr. Welch is a Fellow of the American Academy of Family Practice and a member of the Hawaii Medical Association, the Maui County Medical Association, and the Human Anatomy and Physiology Society (HAPS). With Dr. Martini, she has coauthored both a textbook on anatomy and physiology and the A&P Applications Manual. She and Dr. Martini were married in 1979, and they have one son. Dr. O’Keefe did her undergraduate studies at Marquette University, attended graduate school at the University of Wisconsin, and received her M.D. from George Washington University. She was the first woman to study orthopedic surgery at The Ohio State University. She did fellowship training in trauma surgery at Loma Linda University. She has always been passionate about global health and has done orthopedic surgery in high-need areas around the world, taking her own surgical teams to places such as the Dominican Republic, Honduras, Peru, Burkina Faso, and New Zealand. She serves on the board of Global Health Partnerships, a group that partners with a clinic serving 50,000 very poor people in rural Kenya. Dr. O’Keefe has enjoyed teaching at all levels and at all the universities where she has lived. She now lives in Albuquerque with her Sweet Ed. She is mother of four, grandmother of thirteen, and foster grandmother to many. Mr. Hutchings was associated with The Royal College of Surgeons of England for 20 years. An engineer by training, he has focused for years on photographing the structure of the human body. The result has been a series of color atlases, including the Color Atlas of Human Anatomy, the Color Atlas of Surface Anatomy, and The Human Skeleton (all published by Mosby-Yearbook Publishing). For his anatomical portrayal of the human body, the International Photographers Association chose Mr. Hutchings as the best photographer of humans in the twentieth century. He lives in North London, where he tries to balance the demands of his photographic assignments with his hobbies of early motor cars and airplanes.